Still Seeking Sanity: Happy Halloween!!! I love Halloween. It's just fun, a time to have a great time, get dressed up, and be a kid again. With Halloween on a Saturday, and the clocks falling back that night, we were relaxed and willing to pack the day full. We might have been a little overzealous with our plans to hit a couple of events in town and go trick or treating that night. We left the house at 11:15 am and got going. Yes, we are crazy. Isn't it obvious by now? With a forecast of showers, a lot of people were praying hard that we would have a rain-free day. And it was! My only fight was sun-spots in the photos, but I'll take it. It was warm (for here) and dry and wonderful. We did not need coats (a first in this area, I think!) and it was absolutely beautiful. Thank you, Lord, for a beautiful day to spend outside! The costumes were completed on time, and the kids were adorable (if I do say so myself!) 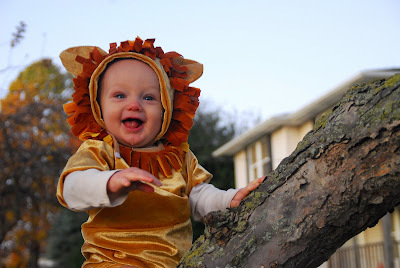 Drew's lion costume was bought, all the rest I made myself. We managed to lose Grant's Tin Man hat at our church trunk-or-treat, so we ran out and bought a new funnel and elastic, and went to Uncle Rob and Auntie Jessica's house to borrow their hot glue gun. While we were there, we had to pet the sweetest chickens in the world. Since we had done the church event, and then gone downtown to trick-or-treat there, the kids were pretty riled up and we got dinner and headed to a park to let them run off some energy sugar. While we were there, Emma Dorothy went across the monkey bars all by herself for the very first time! And the lion climbed a tree, as lions often do, right? Then on to family trick-or-treating. We went on the round of aunts and grandparents houses, trick or treating and taking pictures. At Grandma and Grandpa's house, we met up with the rest of the family and Emma and Lily Dorothy and Thumbelina rode Uncle Wade, who was a very good sport. And at Auntie Amy's, she reminded me that we needed a group shot. By this time, it was waaaaay past bedtime, but my sugar-filled children did great. As we were leaving Amy's, which was our last stop, Grant said, "Mommy, we go trick or treating tomorrow?" I love this age! But as fun as it all was, at the end of the day, there's no place like home! Where are the pictures of Toto??????? I mean, your kids are adorable & the costumes turned out great! Now, where are the pictures of Toto???? I had already seen most of these pictures on Facebook, so I just have to say that adorable little lion is even more so the second time around. Just the cutest little kids! And I love the group shot. We did TrunkorTreat at my church too. It is so much fun to see all the adorable costumes.